Presenting the first compositions for Elliott Hughes' Augmented Trumpet. 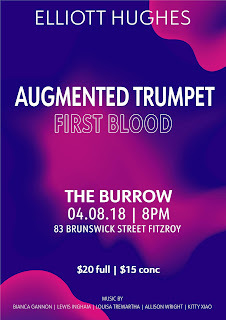 Six Melbourne composers have written new works for trumpet & electronics, designed to feature the homebuilt valve sensor that makes this instrument 'augmented'. The sensor allows the electronics to synchronise with the acoustic sound through the movement of the valves, opening up new possibilities for each composer to explore. New works by Elliott Hughes, Bianca Gannon, Lewis Ingham, Louisa Trewartha, Allison Wright & Kitty Xiao. Live visuals will also accompany the new pieces, creating a vivid multi-sensory experience.